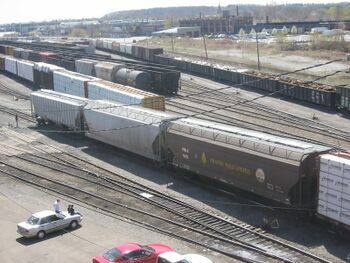 A small railyard displaying a variety of different kinds of freight car. A railyard is a facility for assembling and marshaling railway vehicles into trains. Railyards consist of parallel tracks, connected by switches. The vehicles in a freight train might have to be in a particular order. Before it leaves yard locomotives would move individual fragments back and forth onto the secondary lines, adding and subtracting vehicles, until the vehicles could be marshaled into the right order. This page was last modified 07:27, 19 March 2010.